Photosynthesis involves the conversion, by various phototrophic organisms, of light energy into organic molecules, with or without the production of oxygen. 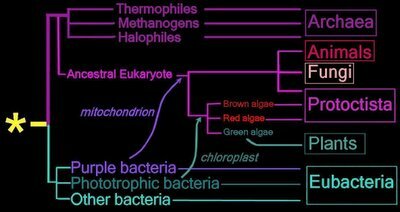 Nonoxygenic, anaerobic photosynthesis evolved^ in prokaryotes before oxygenic photosynthesis, and is found in green filamentous, green sulfur, purple sulfur, and purple nonsulfur bacteria. Photosynthesis in green sulfur bacteria such as Chlorobium tepidum takes place in the chlorosome. Oxygenic photosynthesis apparently developed several billion years ago in an ancestor of present day Cyanobacteria. Oxygenic photosynthesis occurs in plants, which possess plastids derived from Cyanobacteria, and in photosynthetic oxygenic prokaryotes, which utilise H2O as electron donor (Cyanobacteria, prochlorophytes). The photosystem machinery of oxygenic photosynthesis is located within the specialized internal thylakoid membrane system. The chloroplast is the site of oxygenic photosynthesis in eukaryotic cells. The current consensus is that chloroplasts originated from Cyanobacteria that have become endosymbionts. This is an origin analogous to the endosymbiotic (im) origin of mitochondria, which are believed derived from the "purple bacteria" (alpha-proteobacteria). The thylakoid membrane, with its embedded membrane-bound pigments, is the structural unit of photosynthesis. Both photosynthetic prokaryotes and photosynthetic eukaryotes possess membranes with embedded photosynthetic pigments. Only eukaryotes, which have a nuclear membrane and membrane-bound organelles, have chloroplasts with an encapsulating membrane. Cyanobacteria and prochlorophytes conduct oxygenic photosynthesis. Several photosynthetic bacteria, such as the sulfur bacteria, do not generate oxygen. Nonoxygenic photosynthesis, or cyclic photophosphorylation differs from oxygenic photosynthesis in several ways other than lack of oxygen production. Nonoxygenic photosynthesis in prokaryotes, utilizing S– or So or H2 as electron donor include green filamentous, green sulfur, purple sulfur, and purple nonsulfur. Pigments are molecules with their own characteristic absorption spectra in response to light. The perceived color of the pigment depends upon the wavelengths of light not absorbed. Chlorophyll absorbs all wavelengths of visible light except green, which it reflects, producing the green color of leaves. Various chlorophylls and accessory pigments have characteristic absorption spectra. The action spectrum of photosynthesis relates to the relative electron-exciting effectiveness of different wavelengths of light. Absorption Spectrum of pigments: results from the ability of pigments to absorb incident electromagnetic radiation. Like the action spectrum, the parameter of interest (light absorbed) is plotted as a function of the wavelength of the radiation. This is the opposite of an emission spectrum where wavelengths emitted by a substance are measured. Action Spectrum of pigments: the efficiency of photochemical response to incident electromagnetic radiation. Like the absorption spectrum, the parameter of interest (here photochemical reaction) is plotted as a function of the wavelength of the radiation. The action spectrum of photosynthesis within an organism resembles the absorption spectra of chlorophyll though it is not identical. This difference arises because accessory pigments play a part in photosynthetic efficiency.